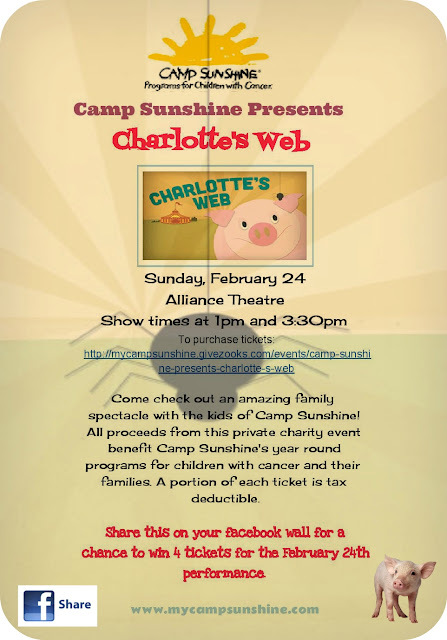 Camp Sunshine Presents Charlotte's Web, Sunday, February 24 at the Alliance Theatre. Come check out an amazing family spectacle with the kids of Camp Sunshine! All proceeds from this private charity event benefit Camp Sunshine's year round programs for children with cancer and their families. A portion of each ticket is tax deductible. Camp Sunshine enriches the lives of Georgia’s children with cancer and their families through free recreational, educational and support programs. This event is one of their biggest fundraisers so I will greatly appreciate if you would be so kind and help us spread the word. *Giveaway ends February 21, 11:00am.